The Fantasy Force | Don't just be a factor. Be a force! You don’t need me to tell you that Adrian Peterson is good at football. But telling you specifically why, is the reason I created The Vision Test. AP is a unique player, not only in the stats he’s amassed through his career, but exactly how he collects them on the field. He’s the high-water mark for RBs and in fantasy football drafts where we’re waiting later and later to select ball carriers, looking at what exceptional athletes do on the field and finding similarly talented backs is key. Basically, Adrian Peterson is what happens when just about everything works properly on a running play. Rather than introduce The Vision Test by telling you what Antonio Andrews does wrong, it would be a better display to tell you what someone like Adrian Peterson does right. The six game sample I used for AP were weeks 4, 6, 10, 12, 14, and 15. The top performances were 10 and 12, his lowest totals were 4 and 6, with weeks 14 and 15 splitting the distance. 118 carries in total not only gave me an informed look at his strengths, but also showed my how defenses can, and do stop the future HOFer from taking over a game. If there’s one knock on Peterson it’s that he isn’t a patient runner with the football. If this was a tendency he developed at some early point he actually found a way to turn it into a strength. Being an impatient runner doesn’t mean he isn’t a smart one. AP gets up to the LOS before defensive linemen and linebackers have a chance to react. This aggressive running style cuts time off for linebackers to react and flow, while also not giving defensive linemen the chance to get off their block. AP also benefits from having developed an incredible reputation in the NFL. Watch any run where Peterson has a little room on the edge and you’ll see either a CB or a boundary linebacker strongly playing contain. The fear of AP’s prowess bouncing outside is so strong that those boundary defenders hold that position as he zips by them and a linebacker making his way to the 3rd level of the defense. AP also routinely makes it look like defenses are over-pursuing him and this is due to what may be the biggest strength in his running style. A lot was made in Week 1 that AP couldn’t run out of the shotgun because he was used to seeing a fullback in front of him. In reality, AP uses any and every blocking lineman like he would a fullback. He gets right behind his lineman in a hurry finds the crease and explodes upfield. Peterson also might be the most decisive runner in the league, he makes his cut and if he can get 2 steps in after that there are no cutbacks. Amazingly there aren’t a ton of bells and whistles in Adrian Peterson’s running style. He gets to the LOS fast, makes his decision and rather than try and bulldoze every defender in front of him, he shows a little burst, keeps his feet moving, and extends runs an extra yard or two by doing so. Peterson sinks his hips down and squats so low in the hole, backside defenders frequently move to contain him as they play to keep him from cutting back. Really what AP is doing is generating power from his entire lower body to run through 1 or 2 arm tackles in traffic. AP really enjoys employing a stutter, or jab step when he sees a crease on the outside or has extra running room on the inside. He’ll often set himself squared up against a defender jab step one way, wait for the defender to react, and then cut across their body in search for more open field. By the time a tackler has caught up with him he’s fighting for extra yards but has the awareness on the field to know when a 2nd or 3rd defender is moving to lay a big hit and goes down to avoid the unnecessary contact. Denver, Kansas City, and Arizona all held Adrian Peterson in check for their games. It’s a complete defensive task to stop Peterson and these units all did so by employing the similar strategies. Outside linebackers or safeties need to keep their contain consistently, some of the most impressive runs AP had in my sample happened when outside defenders over-pursued and he bounced outside for big gains. The defensive line has an equally hard task, A gap rushers need to just hold up the center or guard blocking them, with Peterson’s aggressive running style any penetration at that spot on the line leads to the defensive tackle having to turn around to grab AP who has already passed them. Defensive ends can use AP’s rush to get right behind his OL to their advantage by driving them back. This throws off Peterson’s timing and when done right, leaves him looking for a running lane as either the DT makes a move or a linebacker comes in to clean things up. Looking at the personnel each of those teams have it’s no wonder they were able to show strong again Peterson. Miller, Ware, Jackson, and Wolfe give him fits all day. KC has the tandem of Tamba Hali and Justin Houston on the outside with the underrated and now retired Mike Devito pushing the OL. Arizona’s clear standout against AP was of course Tyrann Mathieu with solid contributions by Deone Bucannon and Calais Campbell. There’s one type of play that stands out when watching AP and it’s how he performs on the standard RB dive. His aggressive running style, burst at the LOS, and the speed/toughness combo he shows at the 2nd and 3rd level of the defense is put on display when the Vikings run it (typically when AP is at the early/mid teens in terms of carry numbers). His 15TH carry against Denver is a dive and goes for a 48 yard TD. Sylvester Williams gets washed out of the inside and Peterson hits the gas and is gone before the safety can change direction. AP is exceptional at hitting that 5th gear when there is open space on an inside run. That play just described was his 15th carry against Denver in Week 4. His 15th carry Week 15 against Chicago looks remarkable similar with its only difference being Chris Prosinski getting just enough of AP to bring him down before he beats him for the TD. His 21st carry Week 12 against the Falcons follows suit with a nasty stutter step/juke mixed in for flavor. However, in that same game against Atlanta Adrian Peterson shows why you can’t sell out your assignment to stop him on the dive play. On 3rd and 1, seeing a pile of bodies in front of him Peterson notices outside linebacker Brooks Reed crash the middle. AP cuts his dive outside, sprints to the open field, keeps the threat of taking the sideline, cuts inside, shakes off a hit from Paul Worrilow and gets taken down after gaining 17 yards. For me, this was Peterson’s most complete run. A display of all his talents, neatly packed into a 3rd down conversion, against what was at that time, one of the top rushing defenses in the league. 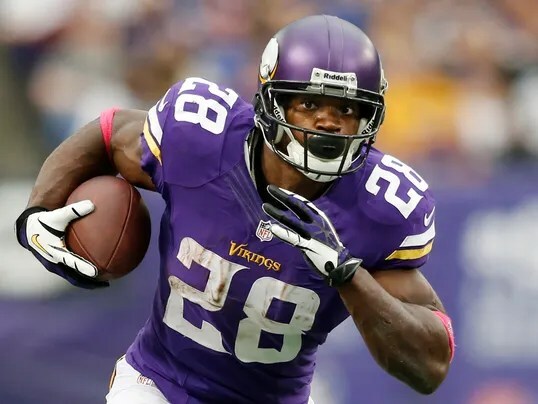 Adrian Peterson is a threat to take it to the house every time he touches the ball and his vision on the field the most dangerous aspect of his game. Combining this with the aggression and power he puts into every run along with his speed and near perfect jab step are what makes him the best RB in the NFL right now. I’m as big a fan of Todd Gurley and Le’Veon Bell as anyone but for redraft leagues, Adrian Peterson is the clear RB to go first. When I was a kid, I loved pro wrestling. I’m not talking about like when I was 13 or 14, I mean when I was 4 I loved pro wrestling. I still have a very vivid memory of my brother teaching me how to do the Sharpshooter, the signature move of my favorite wrestler Bret Hart. As fun as it was to watch on TV I really enjoyed my wrestling action figures as well. The stable at the Jordan household included to the best of my memory Bret and Owen Hart, Ultimate Warrior, Ric Flair, Hulk Hogan, The British Bulldogs, and a tag team I swear I googled for 20 minutes to find just to include them, The Bushwhackers. Even had a little blue ring with the ropes for them to wrestle in and everything. This must have made it odd when I was 5 and asked my mother if she could buy me a dollhouse. Dolls weren’t of any previous interest to me, it was all Legos and wrestlers. There were no questions, no, “boys don’t play with dollhouses” discussions to be had. I asked for it, and when she could my mother purchased me a dollhouse and waited to see what plans I had in store for it. It’s weird how our memories work, right now I can’t tell you how I had my coffee earlier today, but I can absolutely remember that dollhouse. It’s not like the one in the picture here, because it’s that exact type. The blue roof and white banisters were crystal clear in my head when I first had the idea to write all this. 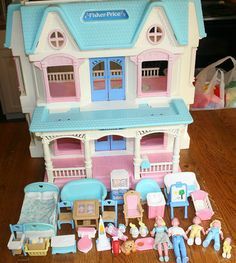 I’m not a huge nostalgia fiend, but when I searched 90s dollhouses and saw it pop up the feeling was indescribable. The closest I can come is to saying that it was like seeing an old friend I had almost forgotten. A rush of childhood memories consumed me after. It even came with furniture and a little dollhouse family, which would have been perfect if I had wanted dolls. From what my mother told me, when we started playing with it I removed the family almost immediately and handed them to her. I got all my wrestlers out and started playing with them in the house instead. I didn’t want a dollhouse for dolls, I wanted a place for my wrestlers to live. The point of the story here, and I promise there is one, is that my mother took the time to see what I was going to do. Asking for a dollhouse probably came out of nowhere, but watching me move the Hart’s in with Ric Flair and the rest of the gang, albeit peculiar, must have made sense when she saw it. Sometimes you just need to see what happens. To this day seeing things is still really important to me. When I read other fantasy writers I’m overwhelmingly drawn to those who reference thing they’ve seen watching film. I respect all the metrics people out there and realize its worth but I’m just more captured by mentions of a wide receiver’s body lean or a quarterback’s quick feet in the pocket. Seeing things is also incredibly important to running backs. In fact a running back’s vision is either praised or trashed in scouting write-ups. I never found there to be a middle ground, or for that matter any further analysis on what seems to be a crucial factor of a running back’s job performance. All of this is exactly why I created what I’m calling: The Vision Test. Going through game film, taking a 6 game sample through the season where a RB had varying degrees of success I analyze and score a running back’s performance by each individual carry. First off, I select 2 games where the RB performed well, 2 mediocre showings, and 2 low-end outings. High yardage games that were boosted by a very long run aren’t used. To me, if a back had 15 carries for 125 and an 80 yard TD run he really went 14 for 45 with either 1 good, or 1 very lucky play as well. As far as what I’m looking for? Well I measure things like what hole the running back went through on the play, as well as if his linemen opened up a running lane; you can’t display good vision if a defensive player is in you face behind the line of scrimmage. I also account for things like whether the lane was forming or closing, doing my best to see things as the back on the field would. After doing this I score how the back performed on the play in different aspects. The cut a back takes into the hole, the burst they show at the LOS, jukes, spins, stiff arms, lowered shoulders, and more is measured and scored per play. Vision really does play a key asset in a RBs success on game day. See the hole and run right to it? An intelligent linebacker will flow downhill and clean things up for a 1 yard gain. But, show patience, cut off your lineman’s hip, sink down into the hole and burst forward as a backside lineman works to the second level? You have a 15 yard gain and 5 energized lineman all racing to help you to your feet so you can huddle up. I come away with the Run Score for the game made up of three scores for the back: their vision, finesse, and strength scores. The separate scores help tell me which backs can put things all together, and which ones might not be great at finding the crease, but slam into or spin around defenders for their gains instead. Additionally, thanks to the help from my buddy Vincenzo, my sheet also gives me the scores for a game broken down into how they performed when running through specific gaps, and how productive a back depending on running lane he is presented on a play. This is all just the introduction to and explanation of this concept. The first player article will be out Wednesday and after that I’ll be covering some of fantasy football’s more hotly debated RBs just in time for redraft season. I’m excited to be doing this and hope it brings more than a few championship trophies to readers. Before I’m out I also want to that 3 writers I brought this to a while ago as I was still working out the kinks. Chris Cheung, Joe Redemann, and Leo Paciga all gave me incredible advice when I presented this to them. Their reactions and suggestions were invaluable and I’m entirely too lucky to know them. Everyone should be following them on Twitter @FFDynasty101, @JayArrNFL, and @Ciga_FF respectively. And of course if you have any questions about The Vision Test or and requests on specific running backs you’d like covered you can find me @The_ATJ. I hit the jackpot today in getting Liz Loza (@LizLoza_FF) of Yahoo Fantasy to come on and talk pre-hype sleepers. Liz and I chat about a 2nd year back that’s being being seriously invested in by his team, a WR that has the perfect blend of rapport and trust with his QB, and an interesting similarity in both of our degrees. I’m joined again by Chris Cheung (@FFDynasty101) of FakePigskin.com as we talk about 2 key components of drafting independent of league type: Proper Understanding of ADP and Composing Tiers. Chris has 2 invaluable articles covering these topics (links below). We also discuss the fun that will ensue when #SFB480 kicks off and thank Scott Fish (@ScottFish24) for the immense amount of work he does for the community. 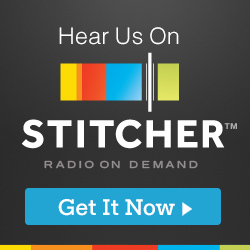 I’m joined by TJ Hernandez (@TJHernandez) of 4for4.com to talk about the DFS (Daily Fantasy Sports) industry as a whole. We discuss topics from the variety of jobs that DFS brings to states and the interesting material it gives writers, to the similarities between the lobby design of DFS and online casinos. We also touch on the highly competitive people playing DFS, scandals that happened last year, and the gambling vs betting debate. I’m joined by one of the best in the industry as Leo Paciga (@Ciga_FF) of DLF and I discuss streamlining his Dynasty Notebooks in 3 easy steps, completely rebuilding a dynasty squad, and the dynasty RB you should be trading for in your leagues.